How to Build Max-Performance Chevy Big-Blocks on a Budget (whew, that's a long title!) fills an empty spot in the Chevy DIY enthusiast book market. Oh, there's no overall shortage of titles covering performance enhancement of Chevrolet's timeless "Mark Engines." There has been, however, an absence of current books on how to modify those engines in a manner that improves performance and does so in a cost-effective manner. Author, David Vizard, who's sort of carved a niche in writing "budget build-up books", does a pretty good job at giving the reader the information he or she needs to put together a 500 or so cubic-inch Rat Motor at a reasonable price. The best of this book is its coverage of high-performance and racing engine theory as it applies to the Chevrolet Mark IV, V and VI "Big-Block V8. Among other subjects, the author delves into combustion chamber and piston design, camshaft and valvetrain theory and the basics of performance exhaust system design. It's valuable to the reader to have such complete and clearly-written material on theory in what's marketed as a book on how to build engines on a tight budget because such information helps DIY engine builders make key decisions on what performance parts represent the best value for their projects. Another feature we liked in this book is its excellent imagery. Photos show close-up detail when necessary, are properly lit and the book's reproduction is top notch. The worst of this book is its lack of coverage on the wide variety of Big-Block Chevrolet performance parts available through GM's Performance Parts Program. A significant portion of How to Build Max-Performance Chevy Big-Blocks on a Budget is devoted to engine build-ups and details on specific performance parts such as cylinder cases, cylinder heads, camshafts, intake manifolds and other parts. GM Performance Parts has a thick catalog of pieces for Big-Block, yet GM is conspicuous by its absence. The author has a reputation for exhaustive research so this omission cannot be an accident. The only conclusion is that David Vizard is predisposed against GM parts. Such a bias is unacceptable and does the reader a disservice. In spite of that one major deficiency, this book still is a great choice for someone looking for Big-Block Chevy information as long as they also have a GM Performance Parts catalog. 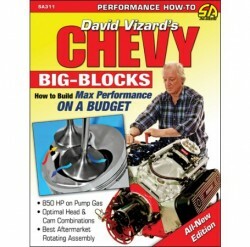 How to Build Max-Performance Chevy Big-Blocks on a Budget is available from Amazon.com, CarTech's web site and other book sellers.